I think by now most people have written off Tom Cruise as a joke and approach his films with much skepticism. Although off the screen he is fair game, I’ve always thought when he finds the right characters, Tom Cruise can be one of the most commanding on screen presences Hollywood has given the world. 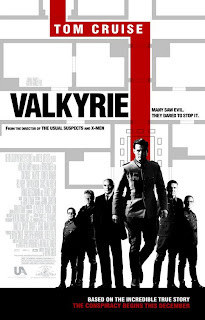 Although he doesn’t exactly “command” Valkyrie, Cruise and the director Bryan Singer (redeeming himself from a weak Superman Returns) both do excellent jobs in creating a nice solid WWII thriller. Sure, I felt that the movie could have been better; more detail about the plan itself, fuller realizations of the characters and their goals. However, the film works and works well without them. Although the outcome is known to anyone with a passing knowledge of history, there are some truly genuine moments of suspense to be found. One lady I sat next to really thought that Hitler had bitten the dust, what more could you ask for?